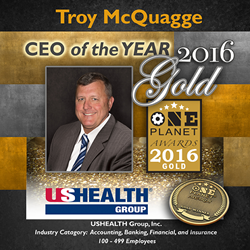 In reality, this award belongs to everyone at USHEALTH Group, Inc.
USHEALTH Group, Inc. CEO Troy McQuagge has been named the Gold Winner as CEO of the Year in the prestigious One Planet℠ Awards. The coveted One Planet Awards is a global premier awards program honoring business and professional excellence in every industry from around the world. Organizations from all over the world are eligible to submit nominations including public and private, for-profit and non-profit, largest to smallest and new start-ups. Mr. McQuagge joined USHEALTH in 2010 and immediately set about the task of turning the company around by first, re-building it's captive distribution agency, USHEALTH Advisors. His success with re-tooling Advisors eventually led Mr. McQuagge to be elected President and CEO of USHEALTH Group, Inc. in 2014. During his tenure, USHEALTH Group, Inc. has registered unprecedented success, growth and profitability in the highly competitive individual health insurance market. “It’s an honor to be named by One Planet Awards to receive this esteemed industry and peer recognition,” said Mr. McQuagge. “In reality, this award belongs to everyone at USHEALTH Group, Inc. It is a testament to our company’s ongoing commitment to solve the healthcare affordability problem for customers by providing them with innovative coverage that can grow as their healthcare needs grow”.